Airline officials say they will keep a closer watch on how much passengers take on board. 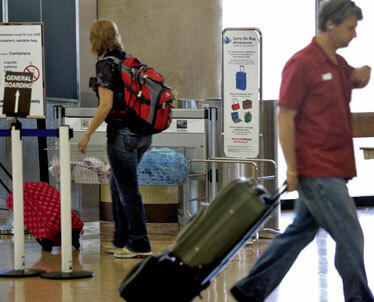 Here, people move carry-on luggage around Sky Harbor International Airport in Phoenix. PHOENIX » Airlines that charge for extra luggage also plan to keep a close eye on carry-on bags to ensure they are not too bulky. The airlines say the carry-on policy came from the Federal Aviation Administration, and they have a responsibility to keep people from sneaking heavy bags onto planes to avoid fees. They say too many bulky bags would overload the overhead bins and force gate crews to delay takeoffs while they checked excess luggage. As a result, travelers who are used to boarding with a large roller case might end up handing $25 to an airline employee before they clear security. PHOENIX » Admit it. That chunky carry-on bag of yours would never fit into the sample box displayed outside the airport gate. Don't expect that bag to get a free ride for long. Checked bags are envisioned as a moneymaker for US Airways, Hawaiian Airlines, go! and other American carriers, and some airline officials say they are going to keep a closer watch on how much you take on board as they begin their new baggage fees. "We're planning on having extra staff where possible, especially at peak times at busy airports," US Airways spokesman Morgan Durrant said. The airlines point out that the carry-on policy came from the Federal Aviation Administration, not the industry, and they have an obligation to keep people from sneaking bulky bags onto planes to avoid fees. Not only is it unfair to the honest, fee-paying traveler, they say, but it would also overload the overhead bins and force gate crews to delay takeoffs while they checked excess bags. But the added scrutiny means something else as well: Every passenger -- even those not used to checking bags -- is going to have to start following the rules. People who are accustomed to boarding with a large roller case might find themselves handing $15 to $25 to an airline employee before they get through security. "It's up to us to get to them before they get too far in line, and say, 'Ma'am or sir, you need to check that bag,'" said Mark Dupont, American Airlines' senior vice president of airport services planning. AMR Corp.'s American Airlines, the nation's largest carrier, was the first to announce fees for a single checked bag. It started charging $15 each way for the first bag on tickets purchased June 15 or later. US Airways Group Inc. will match that fee for tickets booked on or after July 9. UAL Corp.'s United Airlines will follow later in the summer with the same bag fee for domestic flights as of Aug. 18. Mesa Air Group Inc., the parent of interisland carrier go!, said last week it would charge $25 for a second piece of checked luggage on all flights starting July 15. Hawaiian said it would start charging $17 for a second checked bag on interisland flights. The airlines say they are responding to tremendous pressure to cover sky-high fuel prices that have erased profits and sunk stock values. The Air Transport Association says fuel costs will hammer the industry this year, contributing to about $13 billion in losses. Most airlines plan to cut back on available seats and routes in hopes of eventually boosting demand and keeping fares high. American, US Airways and United also will shed thousands of jobs to cut costs. "They're in such trouble," said Honor Guthrie, 45, an American Airlines passenger on her way back to Chicago from Phoenix. Guthrie said she understood that fuel costs are killing the industry. Next time she travels, Guthrie said, she will likely take something smaller than the large black roller case that she brought on the Phoenix trip. "I'll wear the same pants a couple of days, same shirt, same skirt. I'll probably do some laundry wherever I go," she said.